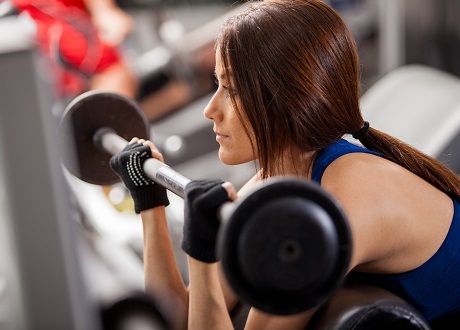 If you’ve decided to get started with a strength training program, you might be wondering whether you should be focusing on barbells or dumbbells – or possibly something else altogether. While you can use weight machines, realize that these won’t be as powerful as free weights are when it comes to improving your conditioning level. Free weights recruit more total core muscles and will also be more natural for your body as they don’t lock you into a fixed range of movement like machine weights do. That said, between barbells and dumbbells, which wins out? Let’s give you a quick run-down so that you can figure out which piece of equipment you should be using. The first thing to think about is the level of core recruitment you’ll experience. We already noted that free weights do work the core more, which is a great thing, but is one superior? The answer is yes. Dumbbells will typically be slightly superior when it comes to building strong core muscles compared to barbells for the simple fact that you won’t be as balanced as you perform the exercise. The less balanced you are, the harder your core is going to have to work. This will be especially the case if you perform single limb dumbbell based moves such as single leg split squats, single leg squats, or single arm shoulder presses. The next factor to take into account is your strength development. Is one superior here? As it turns out, most likely. Most people will find they can lift more with a barbell for the opposite reason the core is worked less. Because there is less of a stabilization requirement when using a barbell, more of your strength and focus can go into hoisting up the weight. So if max strength gains are your goal, opt for barbell training more frequently. The last thing that you need to factor in when making your selection is the range of movements that you can do. Here, dumbbells win out. There are exercises you can perform with dumbbells that you simply cannot perform with barbells. For instance, the chest fly or lateral raise. By adding dumbbells into the mix, you can ensure that you hit your muscles from all angles. So there you have a few of the main points of consideration when selecting which type of equipment to get into your workout program. Always remember that it doesn’t necessarily have to be one or the other however. In an ideal world, you would use both types of equipment as you move through your plan. This way, you get the best of both worlds. Want a complete workout program that’ll challenge your body, getting you fitter, leaner, and healthier? Check out OpenFitness.com for plenty of options.